Most people like to use iCloud to sync iPhone’s photos, for iCloud securely stores our photos, videos, documents, music, apps, and more — and keeps them updated across all our devices. So you always have access to what you want, wherever you want it. However, the limitations of iCloud’s service make it fail to satisfy people’s needs so people have to look for other platforms for storing the photos, such as Android device. Besides, iPhone user might be trapped into confusion when they want to transfer images to Android devices. To transfer iCloud photos to Android is the issue that trouble many people. There comes to the question: how to get photos from iCloud to Android. One simple and obvious way to transfer photo from iCloud to Android is to download the photos from iCloud to PC first and then transfer them from PC to Android. Below are the instructions for downloading photos from iCloud to PC. 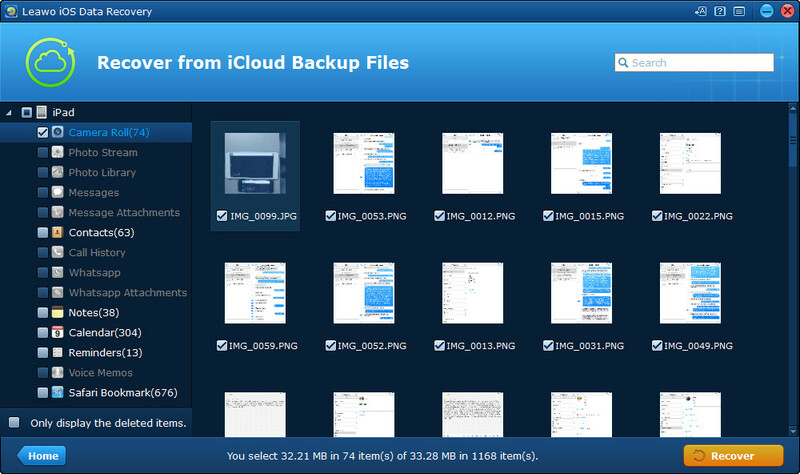 Tip: Before transferring iCloud photos to Android, you need to make sure that your iPhone is backed up to iCloud. Once that’s done, you’re ready to get iCloud photos on Android. Step one: Launch web browser in the computer. Enter the website iCloud.com and sign in with your Apple ID and password. Click iCloud Photos in the top left corner of your screen. Step two: Select the photos that you want and click the download icon in the top right corner of your screen to save them in the computer. Connect your phone to your computer via USB cable and transfer iCloud photos to Android. To use Photos, go to iCloud Settings to your iOS device, tap on Photos, and turn on iCloud Photo Library. Make sure that you’ve installed the device driver of Android phone in your computer so that it will be detected. We can also use a third party program Leawo iOS Data Recovery to transfer iCloud photos to Android. 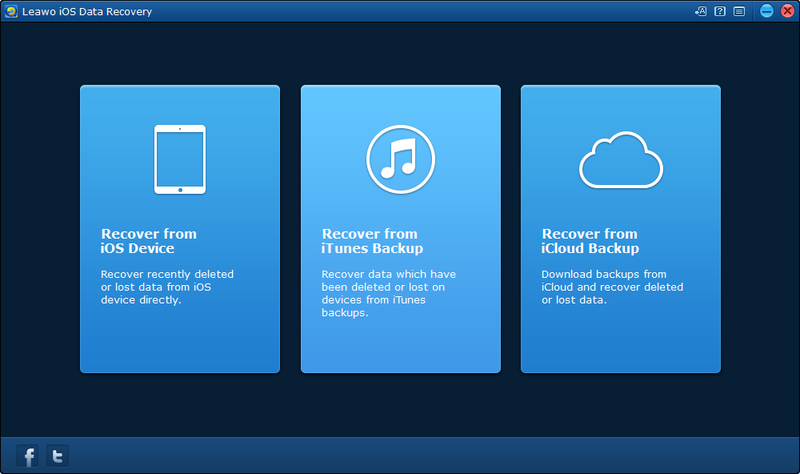 Leawo iOS Data Recovery is an all-inclusive data recovery software app for iPhone, iPad and iPod devices. It could act as iPhone data recovery software, iPad data recovery software, and iPod data recovery software to recover deleted or lost data for all models of iPhone, iPad and iPod, so as to help you avoid data loss due to mistaken deleting or other occasions. Up to 14 types of data could be recovered easily. Leawo iOS Data Recovery is an iPhone/iPad/iPod Touch recovery software combo as well as an iPhone/iPad/iPod Touch data backup tool. Run the software Leawo iOS Data Recovery in your computer. 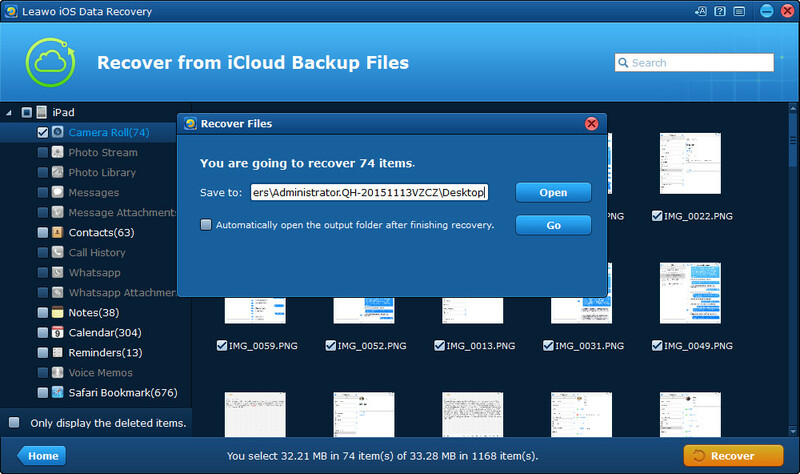 Click the third tab on the main interface to recover data from iCloud backup. 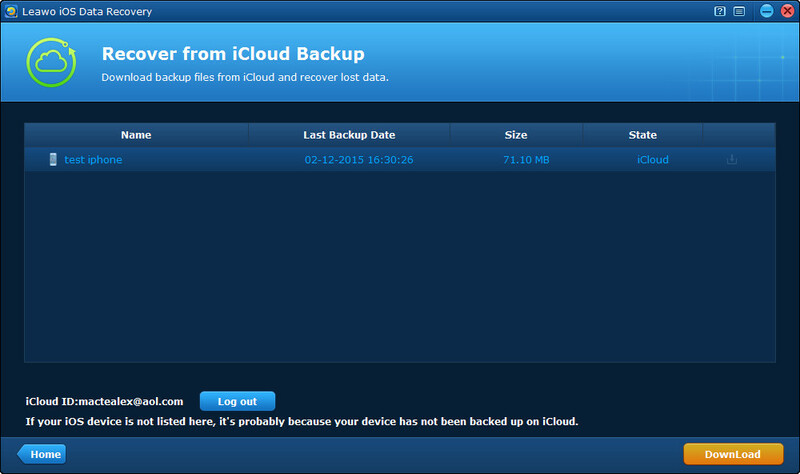 Log on iCloud with Apple ID and password after choosing recovering from iCloud backup. 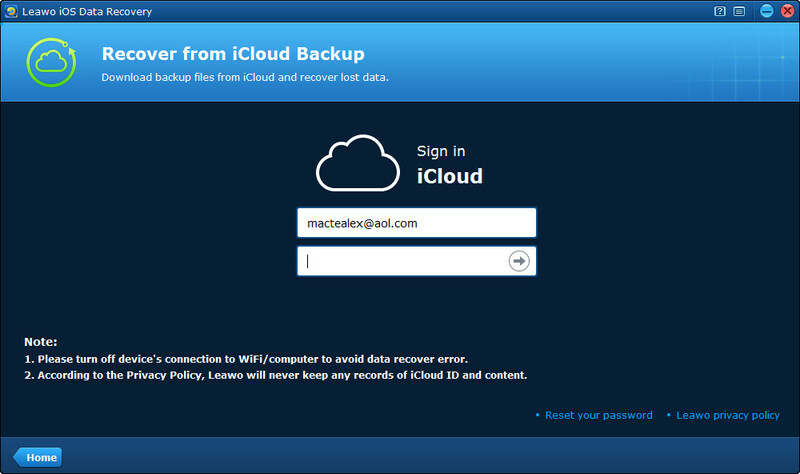 After logging on iCloud, the program Leawo iOS Data Recovery, would scan your backup on iCloud automatically. After the scanning is completed, all your backup would be shown on the list. Click Download button at the bottom left to download the backup and then save the photos to computer hard drive. After the program finishes downloading the backup, it will start scanning it automatically and when it’ s done, all the content in the backup would be shown on the interface. On the left column are the data categories. Select one category and check the files that you want to recover. As with other recovery modes, you can choose to display only the deleted items by ticking “Only display the deleted items”. After choosing all the files you want to recover, click the Recover button and then it will appear a window. Just as other recovery mode, the program would back up the files you are restoring to your iOS device to your computer. All that you need to do is to set the output directory for the backup on the pop-up window. Click Open button to set the output directory and you can have the program open the output folder when it finishes restoring data to your device by ticking “Automatically open the output folder after finishing recovery”. And then click Go. With the both method, you can transfer iCloud photos on Android easily. Now you can share your nice photos with your family and friends with Android phone too. Besides, with Leawo iOS Data Recovery, you can only have iCloud photos on Android, but also have 100% recover deleted or lost data from iTunes, iCloud and iOS Devices (iPhone, iPad, and iPod) safely and accurately!